The Mike Andersen Band have put together a CD which although it doesn't appear to be in the shops as yet, is one I urge you to watch out for. 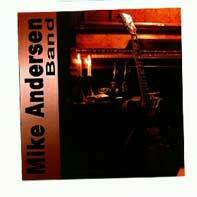 Mike Andersen comes from Denmark and is only 24 years old, but musically sounds a lot older. The band features Dave Stevens on bass who was a founding member of Paul Lamb & The Kingsnakes, he was also a member of Otis Grand's Band for 3 years which lead him to playing with Ike Turner's Review. Mads "Tiny" Andersen, drums was also in Otis Grand's band for 3 years, Mads has also played along side Steve Cropper, Kim Wilson and Joe Louis Walker. Claus Sand on Keyboards has played The Frimer band. Morten Elbek on sax and Thomas Caudery on trumpet make up the band. The album starts off with a lively brass lead "Take It Like A Man" written by Chuck Willis, it sizzles along at a great swinging pace with Mike playing in a T-Bone Walker style also adding a good soulful vocal as well. Freddie King's "Funny Bone" sees Mike almost playing Freddie to perfection. Whilst Mike is a gifted guitar player he doesn't sound flash and his playing on "Don't Answer The Door" often performed by B.B.King, is a joy as he gets B.B. 's phrasings exactly spot on. Ike Turner's "Much Later" is a bubbly song which the band handle in a swinging way, with Mike doing Ike's whammy trick on the guitar to add to this great number. Johnny "Guitar" Watson's "Cuttin' In" is a much more subdued sound with some good Hammond B3 fills from Claus Sand also Mike with his soulful voice and a well timed guitar solo, make this my favourite track from the album. I've said it before, the blues doesn't have to come from America, it is performed just as good in Europe and just lately there seems to be a good supply of great bluesmen from Denmark. The Mike Andersen Band is certainly one band to have emerged, do watch out for them in the future as the band have demonstrated well on this album that they have a good future in the Blues. The album is worth seeking out. This review is copyright © 2001 by Dave Thomas, and Blues On Stage, all rights reserved. Copy, duplication or download prohibited without written permission. For permission to use this review please send an E-mail to Ray Stiles.